Although the term “Mouseion” (Museum-house of the Muses) first emerges in Hellenistic Alexandria, the first modern collections of objects of art appeared in Renaissance Italy. These were mostly princely or regal collections, and “mixed up not only sculpture and painting but also objects of natural science, specimens of rocks, corals, freaks.” It was only in the 18th century that a tendency to separate the types of items first emerged. Classification became gradually the dominant criterion for arranging collections, and museum space reflecting the contemporary role of classification in observing things, comparing them and naming them accordingly. The British Museum of 1753 was a characteristically English institution which had no regal or princely origin (same as the British Library and the Royal Academy) and was public from the start. Parliament was responsible for its running and the purchase of artifacts. The current spirit of Enlightenment produced an enthusiasm for equality of opportunity of learning. The purpose of the museum was to exhibit objects for the education and entertainment of the visitor. 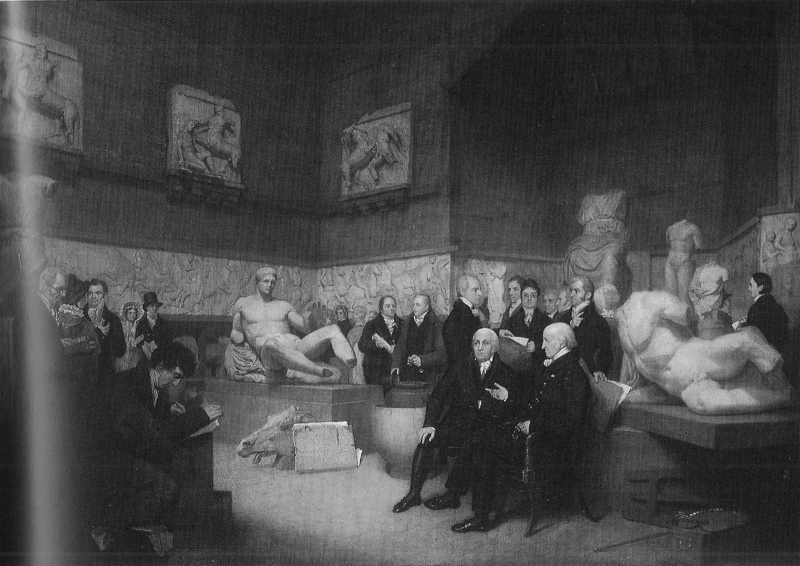 Lord Elgin’s collection of the Parthenon antiquities was acquired by the British Museum on 8 August of 1816. Over the course of the next two centuries, these exhibits have been a central theme of the BM, and have adopted the label of the ‘Elgin Marbles’. Museums consciously or otherwise, adopt an agenda in the way they present their material. The logic of classification in the layout of the presentation has a great effect on the resulting visit experience. The overall lighting of the space, direct artificial lighting on individual marble figures, the framing and the interrelation between them are important factors of the exhibition. In some cases, as at the British Museum, the presentation remains as neutral as possible, while at others, the architecture of the space has a significant effect on the perception of the exhibits. In the case of the NAM, Tschumi’s iconic architecture competes with the exhibits for the visitors’ attention.